Eyes: Water white with very pale hints of yellow. Clear and brillant. 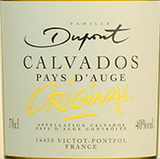 Nose: Powerful, fine, fresh and very complex for a Calvados of only this age, fruit at first then floral. The aromas of green apple and citrus predominate, with hints of cherry and floral notes. Mouth: Fresh attack, supple and round in the mouth, consistent, shows long and intense in retro-olfaction. - Storage: very long, bottles upright without special precautions. - As an Aperitif: on its own, over ice or with a drop or two of water. A very good eau-de-vie base for cocktails. - With Food: Serve ice cold with marinated or smoked fish. - With the Dessert: With dark chocolate cakes and apple sorbets.